These excellent tours are run by Robin (the driver & host), Margaret (hostess) and Judith (hostess) in their mini bus. 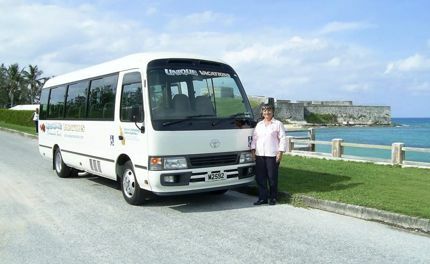 Other than offering bus tours in both eastern and western parishes, they also organize personalized Bermuda tours. The guides are all Blue Flag certified from Bermuda Department of Tourism and have a wealth of information on Bermuda's history and landmarks. The minibus with a capacity of 20 also has limited wheel chair access. However, some of the places covered in the tour may not be suitable for wheel chairs. Update March 2018: Although they earlier provided pick-up services from hotels and cruise ships, they no longer do so as most hotels in Bermuda today offer their own tours. Here are the different bus tours offered by Unique Vacations. 6) Sandys Parish in the west end which includes islands like Somerset, Boaz, Watford and Ireland Island, holds many hidden sightseeing treasures. This tour includes a visit to the City of Hamilton as well, which was established as the capital of Bermuda in 1815. Over the years it has become a bustling financial center for international business and remains as a shoppers paradise. Western Tours depart at 2 p.m. (Pick up starting from 1:15 p.m). Admission fees are included in tour prices. You will travel back in time with a visit to St. George, the first capital of Bermuda established in the early 1600s and a UNESCO World Heritage Site. Some of the highlights in the town are the old State House, Somers Garden, the Unfinished Church and Fort St. Catherine. Explore the Crystal Caves and other places of interest en route to St. George. After exploring the town of St. George, discover the modern City of Hamilton, with its historic and modern buildings. The unique features on the buildings preserve the architectural heritage of Bermuda, while accommodating the requirements of a modern business community. Eastern Tours depart at 10 a.m. (Pick-up starting from 9:15 a.m). Admission fees are included in tour prices. The operator also organizes customized tours to suit your personal choice. However there should be minimum of 8 persons in your group. You need to contact them to design such tour. If you are in a group of up to 7 persons, then taking a personalized taxi tour is recommended. Update 2015: For those groups arriving via cruise ship with less than 8 persons in their group, Unique Vacations is contracted to conduct wheelchair accessible tours for NCL and RCCL and these tours can be booked through Cruise Ship's Shore Excursion Desk, before their departure or while on board the ship. The tour is a 5 hour Bermuda Island Tour, which gives the participants an overview of Bermuda’s history, culture and beauty. They make stops for photos, restrooms, etc., and that gives the guests some time to explore, especially in the Town of St. George. Have taken Unique Tours with Judith and Robyn a few times, always enjoyable and carefully planned excursions. Never a disappointment. Their scooter/wheelchair accessibility is unsurpassed, my only way to see as much as possible on Bermuda. Never a disappointment, always a new experience. Thanks to your website, our family had a perfect personalized tour with Unique Vacations in Bermuda. We were a family of seven; ages 8 to 68 who spent the day with Judith, our guide, and Robin our driver. Since we had only 2 days to spend in Bermuda and wanted to see as much as possible, I arranged for a private tour with Unique Vacations. My family saw and learned so much during our 6 hour tour. Judith never stopped talking - she pointed out everything. She answered questions knowledgeably. Our stop at the Underwater Exploration Institute with it's incredible shell collection was a highlight for all; especially our 8 year old granddaughter. Robin, our driver, maneuvered our very comfortable bus with expertise. Communicating with Judith, regarding our reservation and preferences, via email, was easy and prompt. We felt that the cost was reasonable for services received. I would give Unique Vacations 5 stars. In my info about Unique Tours, I forgot to mention how valuable your website was to my family. Thank you so much for all the wonderful information and links. Your site gave us all the information we needed to make the best of our limited time in Bermuda. We were there on a cruise ship and only had two days. Thanks again.